There are rumors floating around about Samsung considering an acquisition of HP/Palm webOS. I am not sure if Samsung is really evaluating or not, but it makes a lot of sense to me. Samsung is doing just fine with Android. Actually, they are doing great. However, the acquisition of Motorola by Google has changed everything. As much as Google is trying to say that they did it just for the IP, I do not foresee them dumping 19,000 employees any time soon. It is obvious that the next great Android phone will come from Motorola, not from Samsung. The mythical Google phone, the one born to kill the iPhone (yeah, right), will be a Motorola device. Not Samsung. Samsung is left with a 3rd party OS game, supporting Android and Microsoft, or/and a choice to take their future in their hands. They have done it already, remember: for feature phones, they have their own OS, Bada. It is doing quite well, actually. What they are missing is their own OS for the high end devices. WebOS could be just that. Now, it is a risky move. webOS still has no developers, which is the reason they did not make it. Samsung would have to build support on it, make it really cool and attractive for developers. Timing - for once - could be on their side. webOS has been built from the beginning with a web app model, rather than a native app model. They added an App Store late and it never really took off. But the market is moving towards web apps, even in mobile. If they time it right, they might have the right OS at the right time. Should Samsung do it? I do not know, but it makes sense. If Google went to buy a mobile device, and Apple went for the iCloud, maybe it is time for Samsung to own a smartphone OS. 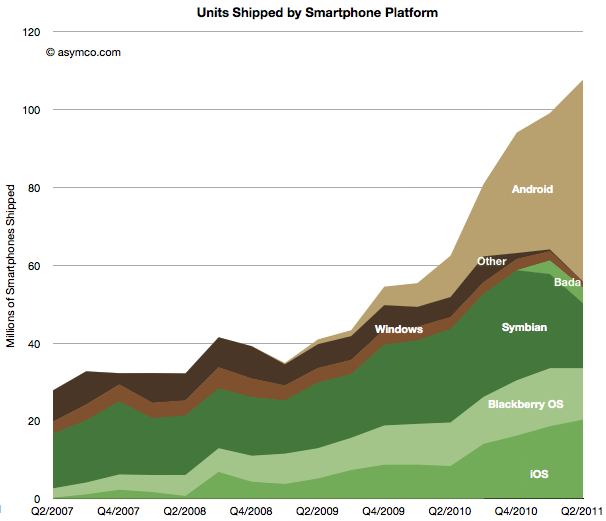 There was a graph on the Asymco site that caught my attention today. It is shown below. I wrote before that I thought there was no room for four mobile OSs. I felt one between Windows and BlackBerry was not going to make it. Considering Nokia is behind Windows, and the strength of Microsoft, I was betting on Windows to be #3. Now I am wondering if there will ever be a #3. I mean, one with significant market share. The way this graph looks, knowing that a Nokia with Windows is not going to be here in Q3 (therefore, this graph is going to look even worse for Q3), considering that the bottom of the market could be taken eventually by BADA, one would conclude there will be two mega players (iOS and Android) and there will just be crumbs for the rest (e.g. below 10%). After all, 3 is the perfect number, but developers would not mind having just two. I think I have seen this pattern before. Last time, one took 90% eventually. I do not think this is going to happen in mobile, though.